This morning the participants in our Palestine of Jesus course had an extended opportunity to soak up the special places along the NW shore of the Sea of Galilee. We had a late checkout from our rooms at the Pilgerhaus, and people were able to visit the nearby Benedictine monastery or walk along the shore to Capernaum. Apart from the ubiquitous gum trees, this is about as close to ‘walking in the footsteps of Jesus’ as anyone could hope to experience. After a light lunch at Tabgha, the course went to Mt Tabor for an extended visit to reflect on the Transfiguration traditions. They then returned to Jerusalem by bus, arriving around 5.30pm. While this was happening, I left early so that I could pick up Clare from Ginosar and drop her to some friends at Tel Aviv University for a few days, before returning my rental car to the Avis service centre in King David Street. On the way we detoured via Ramat Hasharon, so that we could enjoy a coffee with Hanan Shafir, the dig photographer at Bethsaida. As I walked back to the College via the Mamilla Center and the Old City, everything seemed pretty calm and there were no unusual security measures. On the way I treated myself to an ancient coin, using some funds given to me for that purpose by Clare and Lizzie at Christmas time. 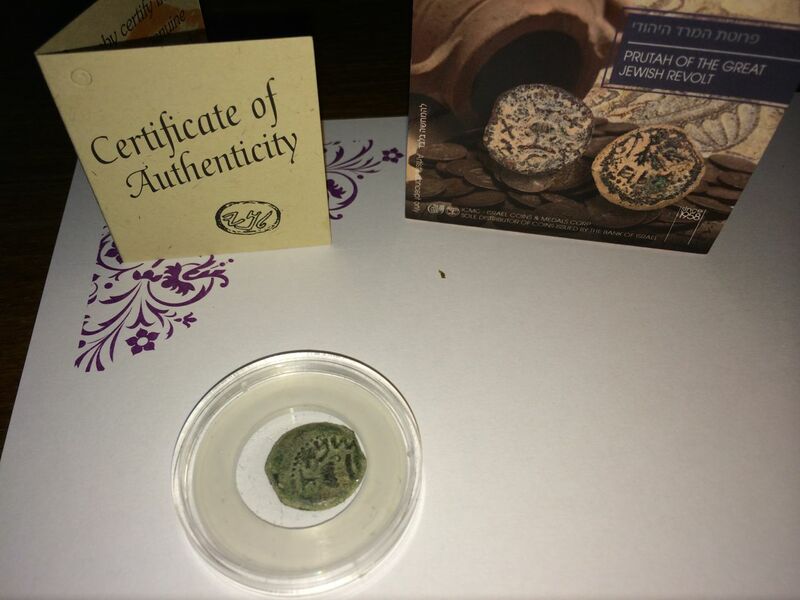 My wee treasure is a prutah (small bronze coin) issued by the rebel Jewish government in the second year of the Great War with Rome (66/73 CE). Since then the security situation seems to have deteriorated somewhat. There are reports of rockets fired from Gaza towards towns in central Israel, and there are helicopters circling over the Old City and the Arab neighbourhoods. It is yet to be seen if this is simply a precautionary measure, or whether we are going to see a repeat of the civil unrest experienced in Arab towns throughout Israel since the murder of a 16 year old Arab by Jewish nationalists last week. This entry was posted in Archaeology, Bethsaida, Coins, Uncategorized and tagged Capernaum, Jerusalem, Mt Tabor, Sea of Galilee, Tabgha. Bookmark the permalink.